Willie Nelson and Friends Museum – over 30 artists in ONE location! “Gee ain’t it funny how time slips away,” as Willie would say. Well, time may slip away but we make sure the memories don’t at the famous Willie Nelson and Friends Museum, one of the largest displays in the world of personal items from Willie and his many friends. 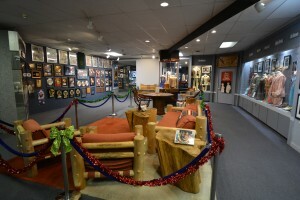 A partial view inside of the Willie Nelson and Friends Museum in Nashville, TN. Willie Nelson Museum earns TripAdvisor 2018 Certificate of Excellence . Compare that to the country music museums you’ll find in downtown Nashville where you’ll pay $20.00 to park along with typical admission fees ranging from $18.00 to $24.00 for adults at each museum you choose to visit – OUCH! Visit us for only $9.95 (with FREE parking) and see the personal items from not just one artist – but more than 30 country music pioneers! Book and purchase your tickets online, and in advance, to receive a special promotional price of only $7.99 plus tax per adult! Just click the date below when you plan to visit and buy your ticket(s). Also, every visitor receives a detailed four page written guide included with your admission fee that describes all the great exhibits and items you’ll see as you tour the museum. And because we want you to remember your great experience, unlike other museums you’re free to take photographs of the great memorabilia and personal items you’ll see as you stroll through country music history. And now, as a result of our expansion we’ve added even more artist displays (see a few here), personal items and memorabilia dedicated to preserving the history and roots of country music! We love the “new” country music artists as well, but our mission is highlighting the stars who built the country music industry and that’s what you’ll see in the museum. But we’re not content to “leave well enough alone”. 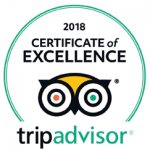 We want to offer you the absolute best country museum experience available anywhere. And we won’t stop improving and expanding until we reach that goal. 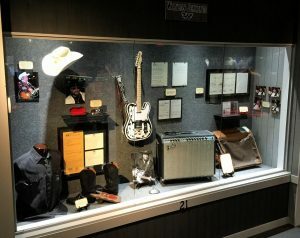 The new Waylon Jennings exhibit now on display at the Willie Nelson and Friends Museum in Nashville, TN. Our latest addition to the Museum is the Waylon Jennings exhibit. Waylon was a superstar, who along with Willie Nelson, created a new genre of music known as outlaw country. We have an extraordinary display of Waylon’s personal items including his last passport used while touring the world with the Highwaymen, handwritten songs and many, many other great items! And if that’s not enough, we are working on some new exhibits that will be opening in the near future including Hank Williams Jr., Little Jimmy Dickens, Tanya Tucker and Tammy Wynette! So if you really want to experience some of the history of the country artists that made country music so popular and turned Nashville into “Music City” – you’ve got to stop by the Willie Nelson and Friends Museum for a visit! Being Nashville natives, we’re fortunate to have been around the country music industry for a long time, especially Willie’s long time storekeepers Jeanie and Frank Oakley who know (and knew) many of the stars who helped transform Nashville into the heart of the country music industry. Leave Willie Nelson and Friends Museum Page – return to Home Page.